Unfortunately the MAG Ireland smart phone app has been withdrawn and is no longer available for download. The developers behind the platform on which the app was built decided that they would stop developing that system. This left us facing a choice of starting over on a new platform, or retiring the MAG Ireland app altogether. We took the decision to retire the MAG Ireland app in October 2014 and to focus our resources on improving the mobile version of our web site instead. Analysis shows that roughly half the traffic to our site is mobile and that share is growing rapidly. We’re looking at ways to improve and develop the site with a view to providing a much better experience for users on mobile devices. 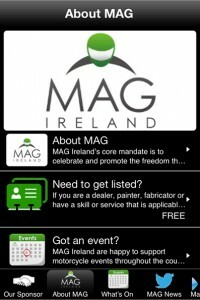 We’re proud to have been able to bring the MAG Ireland app to fruition, a first for any riders organisation in Europe. Now that the time has come to close that chapter and begin another. We’d like to extend our sincere thanks to everyone who made the app possible, to Carole Nash Insurance whose sponsorship allowed us to bring it to you free of charge, and above all to you, the end users, for the enthusiasm you showed and the feedback you provided. If you still have the app installed on your phone we recommend you delete it as the information it carries is now out of date.